Andre Curbelo, Long Island Lutheran: To this observer, Curbelo was the most impactful player that we saw in the four games on championship Saturday. The 6’1 junior was seemingly one step ahead of every play at both ends of the court. While his game-high 28 points were nice, they weren’t nearly as impressive as his multiple assists and steals. Curbelo is one of those rare point guards that can get the defense to move the way he wants it to so the offense can get the shot it wants. Defensively he reacts quickly to ball movement, is alert to double-team or come from off the ball to strip, and simply has great anticipatory instincts. Curbelo has no problem making shots from all three levels when his number is called, but he definitely fits the mold of a true floor general that looks to get others involved before he gets his. Chase Johnston, Westminster Academy: The 6’2 senior has always been highly regarded as a three-point shooter, but the 52 points that Johnston dropped on Saturday showed a much more refined and all-around game. Yes, he did connect on eight shots from beyond the arc, but he also did major damage simply by moving without the ball, curling off screens, and making quick shots in the lane when he came off those curls. Not surprisingly, he was money from the free throw line, going 12-12 over the course of the game. He also did a solid job of handling the basketball when The Villages attempted to extend pressure to get back into the game. It has been very satisfying to watch Johnston go from being simply a spot up three-point shooter as a freshman to a dynamic all-around player as a senior. The fans at Purdue-Fort Wayne will quickly embrace him. Algenis Quintana, Miami Christian: The 6’1 senior guard from Miami Christian raises his stock every time we watch him play. On Saturday, he did a solid job of using his speed and quickness to disrupt the defense, get into the lane and kick the ball out to open shooters (the shots just didn’t fall). Quintana was also effective when deciding to score on drives, often making tough shots through contact in traffic. He shoots the ball well from behind the three-point line but doesn’t have a quick trigger. Quintana generally makes the right shot vs. pass decision when on the move. Defensively, he has good lateral quickness and makes every effort to make life difficult for the opponent on that end of the floor. Evan Mobley, Rancho Christian: The 6’11 junior from California is generally considered not only the top player in the national 2020 Class but possibly the best prospect in high school basketball regardless of class. Though finishing with only thirteen points in the championship game loss to Montverde, it is easy to see why Mobley is so highly valued. At his size, he moves gracefully on the court. Mobley also has an advanced skill set as he can score in the post with solid footwork and soft touch as well as on the perimeter as he has very good ball-handling and passing skills. There is a lot of Durant/Dirk to Mobley’s game and no doubt he will join Durant (Dirk should be retired by then) in the NBA when he becomes draft eligible. Cam’Ron Fletcher, St. Louis Vashon: The 6’7 junior was just as impressive here as he was last month at the City of Palms Classic. A true wing forward that scores well from three-point range as well as on drives to the basket, Fletcher is a tough cover for any player. He’s a very good athlete with length and uses his physical gifts well when it comes to rebounding at both ends and defending players at multiple positions. Mady Sissoko, Wasatch Academy: The 6’9 junior from Mali was a force on the interior in the game we took in. With his long arms and leaping ability, he plays bigger than 6’9. Sissoko did a great job of protecting the rim and challenged everybody that came into the lane. Very quick off the floor, he grabbed rebounds out of his area and did a good job of coming up with balls on second and third effort. Sissoko runs the floor swiftly in transition and proved to be a solid scorer around the basket. Precious Achiuwa, Montverde Academy: Named MVP for his 25 point, 10 rebound title game performance, Achiuwa was active and engaged in the game from the start. Strong and powerful, he explodes to the basket for scores and rebounds. While not considered a consistent perimeter threat, Achiuwa showed that he is making strides in that area, hitting a couple of foul line area jumpers as well as a three. He is fast up and down the floor, most often beating his assigned defender down the court for easy scores. His four steals on the defensive end show he covers a lot of ground quickly and has a knack for getting to errant passes. Cade Cunningham, Montverde Academy: The 6’7 junior fills that stat sheet but doesn’t blow onlookers away in the manner in which he does it. For instance, over the course of twenty minutes in the title game, Cunningham had 12 points on 6-10 shooting, 5 rebounds, 4 assists, 0 turnovers, 2 blocks and 2 steals. That’s incredibly efficient and productive but none of those plays were highlight worthy dunks, flashy passes, or displays of incredible athleticism. Cunningham’s basketball IQ, court vision, and ability to control the pace of the game are off the charts. Quite simply, he makes the Montverde machine go. 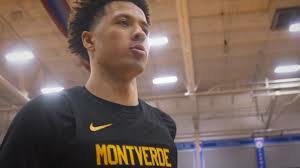 The Freshmen, Montverde Academy: For any program, let alone a high-profile one like Montverde Academy, it would be rare to see three freshmen on the court at the varsity level. However, 6’4 Dariq Whitehead, 5’10 Ryan Nembhard, and 6’8 Caleb Houston, found themselves playing meaningful minutes together in the championship game. Whitehead displayed an advanced ability to score for a freshman and was also impactful on the defensive end with his lateral quickness and tenacity. Nembhard was solid with the basketball, unfazed by the level of competition, and had no problem in challenging and succeeding against bigger, and stronger players at either end of the court. Houston shows inside/outside skills, rebounds the ball well, and has the capability to defend multiple positions. Should all three stay at Montverde, the Eagles have an incredibly promising future. The Support Staff, Montverde Academy: From the moment we checked in to the moment we walked out to our car, the staff that run the Montverde Academy Invitational Tournament could not have been more accommodating. Whether it was a complementary bottle of water, a needed stat, or an interview request, someone was always available and quick to help out members of the media. The Fans (in general) and Student Section (in particular), Montverde Academy: The Montverde arena was Standing Room Only for the championship game, as the community gladly fills the stands during this event. However, it is the Montverde students that really make it a charged atmosphere. Filling bleachers at one end of the court as well as a quarter of one side of the gym, they stood and were noisy the entire time. While not creative with their chants like some college teams, they put a lot of energy into “the classics” in an effort to enliven the game. Their storming of the court and chants of “no school Monday” after the Eagles’ win is part of the tradition and fun of the event. All things considered, the event is one of the best of all the events we attend throughout the state each highs school season.